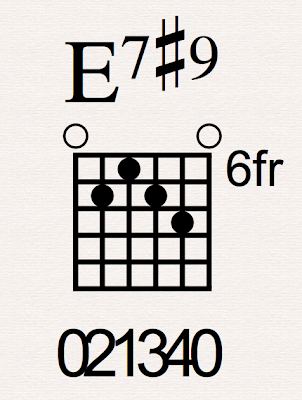 This chord is labeled as a E7#9. Don't tell your jazz musician friends, but a #9 is really a flat 10. There is an D7#9 in the Beatles' song "Taxman", if memory serves. If you don't know what a sharp nine is, it's time to bone up on your music theory. Don't worry about that now, though. Grab a guitar and play it! Wham! There it is: "The Hendrix Chord." I've heard guitarists refer to this chord as "The Hendrix Chord." It's featured in a lot of Hendrix original compositions, most famoustly, as the tonic chord in "Purple Haze". Stevie Ray Vaughan likes it quite a bit, too. Check out "Testify," and "Mary Had a Little Lamb". You can grab the Tab for it HERE.